Vinyl stickers are vastly used for branding purpose. The most economical and easy way of branding. Normal Vinyl stickers costs around Rs, 50/- to Rs.200/ sq. feet. Stickers can be pasted on Glass, Plywood, Metal sheets, or any laminates. Vinyl stickers are vastly used for branding purpose. The most economical and easy way of branding. Normal Vinyl stickers costs around Rs,50/- to Rs.200/ sq. feet. Stickers can be pasted on Glass, Plywood, Metal sheets, or any laminates. Multicolor vinyl stickers used for outdoor & indoor publicity & advertisement. Vinyl stickers can be used for sign boards and graphics also. 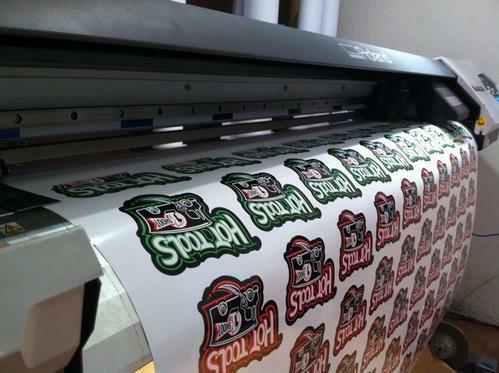 Vinyl printed stickers are pasted on PVC foam sheets to make good looking posters and banners. Vinyl stickers are also available in standard make like 3M make vinyl stickers are available with us for which we provide 3 years and 5 years warrantee for not getting fad. Even EVERY make Vinyl stickers are also avilable with us for which we can provide 3 years and 5 years warrantee. Standard make vinyl are having good strength for adhesives which can not be romoved easily. Established in the year 2004, we "Radiance Neon" completed over 1500 installations across all over India manufacturing & supplying age less neon signs & led signboards. always offering products with best quality material & great durability. Offering client's complete solutions from designing to installation of advertisement hoardings, multi-color neon/ led signs, back-lit glow-signs, interior signs, industrial safety signs, pylons, led displays, etc. also offering creativity or innovations in hoardings & signboards. Our advanced manufacturing unit assists us in undertaking bulk production of all range of signage. moreover, we provide guarantee of 1 year for all our products, and maintain our market credibility. We assure to supply our range of products within shortest lead time and maximize the contentment of our clients.